Haiti's President Michel Martelly, center, leaves a news conference at the National Palace in Port-au-Prince March 8, 2012. Still, a lot has arguably balked at coming to Haiti because of the chronic discord nagging Martelly's first year in office. Leading up to last year's presidential election, for example, exiled former Presidents Jean-Claude "Baby Doc" Duvalier and Jean-Bertrand Aristide made surprise returns. They have since created unwelcome distractions, especially since Martelly is known to have a soft spot for the Duvalier family's brutal 20th-century dictatorship  for whose epic corruption a Haitian judge recently ruled Duvalier must stand trial. 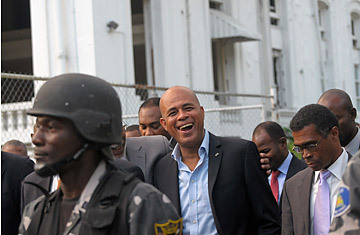 "I probably would not have invited them to come back to Haiti," Martelly said. But he's not pushing for prosecution: "That has to do with the judiciary system. I have nothing to do with this." Duvalier and Aristide (whose more leftist presidency had its own corruption and human rights abuses to answer for) are just among a litany of problems, however. Martelly's rebuilding plans depend to a large extent on a strong Prime Minister, who serves as the head of government and is a key figure in doling out contracts. Parliament  whose leaders bristle at Martelly's outsider status and often arrogant populism, and are probing whether he and some of his top officials have dual citizenship, which in Haiti disqualifies politicians from office  rejected Martelly's first two nominees for the post last year. Conille bolted after just four months on the job. "If one chooses to be against me and hate on me, I don't even have time to listen to these rumors or these conflicts," Martelly says. "I don't want to fight the parliament. If there is a problem, it's on [their] side." Haiti needs both sides to focus more on the job at hand. Martelly insists his priorities are projects like the nearly complete, $98 million 16-6 Plan, designed to relocate Haitian earthquake refugees from six large tent camps into 16 neighborhoods that can absorb them, complete with benefits like rent subsidies. That effort, along with a plan to empty the massive Champs de Mars camp in front of the quake-toppled presidential palace in central Port-au-Prince, could give new homes to almost 63,000 people who have been living in squalor for more than two years. That's still a small portion of the almost 500,000 who remain homeless (although that total has dropped from the high of 1.5 million in 2010). A recurrence of the cholera epidemic that hit Haiti in late 2010 and has since killed thousands is another concern as the rainy season arrives, especially since aid money may be running out for maintaining outdoor latrines in the camps. But Martelly believes "we're on the right track." He's also confident he's changing "a dark image...a perception that Haiti is just about bad news." But the Bautista allegations, on top of his clashes with Parliament, won't help that campaign  or persuade international donor countries, many of which are waiting to see more transparent and effective governance in Haiti, to free up the billions of dollars in outstanding reconstruction pledges. Martelly seems to dismiss the concerns: "Although you hear [negative] things, you go talk to people and you find out that they are very confident," he told TIME. "They feel like they finally have a president working for them...I have no stress. I was ready for this." Maybe so, but in reality most of Haiti's 10 million people are still pretty stressed  and what they're ready for is stable government.